1950’s or early 60’s sewing kit. Pull off the red cap (which is the thimble) and there are a couple of needles and a spool of thread with 3 different colors. Scarce item. It’s interesting that many of these oddball items are few and far between. It suggests that they were handouts at special occasion gatherings or business meetings. P-6 style caplifter / corkscrew combo. More often seen for F&S. Seldom the Stegmaier one shows up. Photo shows the corkscrew partially screwed out. Nice example of a cancelled Internal Revenue stamp. 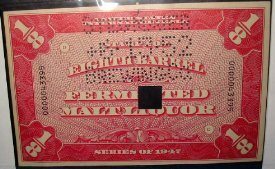 This is a 1947 series stamp for 1/8 barrel fermented malt liquor. The little round punched holes are for Stegmaier Brewing Co.